The Garden View International House is a YWCA operated property with 130 rooms with great panoramic views of the Hong Kong Botanical Gardens. Conveniently located in Mid-Levels, an up-market residential area, the hotel is easily accessable to many areas of Hong Kong Island. 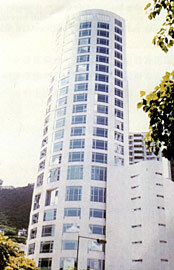 Situated on Macdonnell Road, a stones throw away from Hong Kong's Botanical Gardens and Peak Tram Depot. The Garden View International House is easily accessible by Mini Bus, Taxi or a 15 minute walk from Central Mass Transit Railway Station. The renowned dining and entertainment district of Lan Kwai Fong is just 10 minutes away, not to mention the other well know dining area of Soho. Chep Lap Kok Airport is a 45 minute drive away or a 25-30 minute train ride away on the Airport Express Station, also located in Central. All rooms offer individually controlled air-conditioning, ensuite bathroom and shower, IDD telephone, in-room laptop/fax port, satellite/cable TV plus tea and coffee making facilities. Rooms comprise Standard, Superior and Suite. Standard and Superior rooms measure 220 sq ft in size, each rooms offers either Twin or Double beds with the allowance for an extra bed if required. Note that not many double bed rooms are available. Facilities include TV, work desk, and bedside control panel. Rooms enjoy city and Botanical Garden views. Suite rooms consist of 2 separate rooms. An open plan kitchenette with utensils and a microwave are found in the first room, along with sofa bed and sitting area. Bedroom offers 1 double bed and TV unit plus ensuite bathroom. Please note some Suite rooms are under renovation. Please check at time of booking.